You can paint along with this project by visiting my etsy shop (http://watercolorgirl.etsy.com) and choosing the icon for the online class. I will send you an email with the reference photo and a ready-to-use drawing for the project. 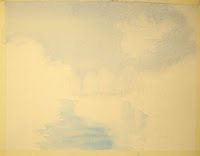 To Begin: Paint a wash in the background for the sky. 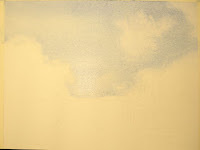 You can either wet the area with water first, then use a stronger pigment, or you can just apply a very wet pigment to the paper using the Flat Wash method. Keep your paper tilted in different directions to keep t he moisture flowing and thus allowing the paper to dry in a more even manner. You can also control the flow of the darker pigment toward the top of the paper, as most skies will appear lighter at the horizon line. I used a mixture of French Ultramarine Blue, Antwerp Blue and Cerulean Blue. I applied this wash to the entire background, then used a clean, crumpled, paper towel to lift areas where I know I want the lighter greens in the trees to shine through. Allow to dry or dry with a hair dryer. Next, apply a mixture of Antwerp Blue and French Ultramarine Blue to the water using a number 10 round brush. Be sure to use horizontal strokes to suggest the same types of values and lines that are suggested in the reference photo.